Our technical strength and problem-solving capabilities extend to Boldrocchi’s Service & Retrofits team. Complementing Boldrocchi’s engineering, manufacturing and testing core, these teams offer knowledgeable installation and commissioning as well as on-site management, support and advice for truly turnkey capabilities on all our products. Our experts are familiar with Boldrocchi equipment and systems and offer maintenance services on other brands as well. When looking to increase production, the perennial question is: must we buy new components or can we reuse what we have? Budget always being a factor, the latter is a popular option. Indeed, when your CAPEX budget is limited, a Boldrocchi refurbishment, retrofit (revamp) or conversion may be the answer. Our specialists will enhance the capabilities of your existing equipment, whether original Boldrocchi equipment or that of another OEM. 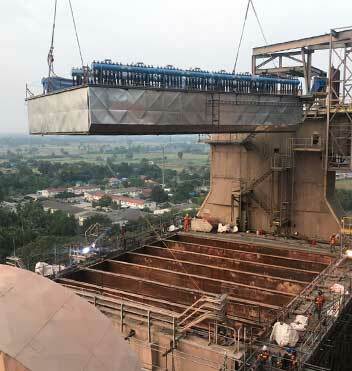 In the past 25 years, Boldrocchi has performed nearly 200 revamps on centrifugal fans alone, most of them aimed at boosting capacity, finding customers cost-effective ways of significantly increasing fan – and therefore plant – performance. Using the casing and as many ancillary parts as possible but replacing the entire internal workings of the system to prolong the life of an obsolete system and increase performance. Keeping the same technology and increasing performance (usually by replacing some inner parts). Using the external casing but transforming the internal parts to change the technology of the system. Most often our conversions mean taking an ESP and turning it into a fabric filter or a hybrid filter.